Although Namibia is best know for it's desert scenery and fishing on remote beaches for salt water species, the country is also a more than decent Bass fishing destination. Water is not abundant in Namibia and lakes of any significant size are few. The 2 largest lakes in the country are the Von Bach Dam, north of Windhoek, near the town of Okahandja and Hardap Dam near the town of Mariental in the south. The country has a small, though active and enthusiastic Bass fishing community who arrange regular tournaments and outings. 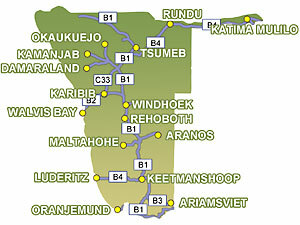 Hardap Dam and resort is located outside the town of Mariental on the upper Fish River. More info . . . Von Bach Dam and resort is located north of Windhoek near the town of Okahandja. More info . . .